A high-level US delegation just returned from Ethiopia, which is arguably America's closest ally on the continent of Africa. How did these two countries become so close? Journalist James Jeffrey explains. 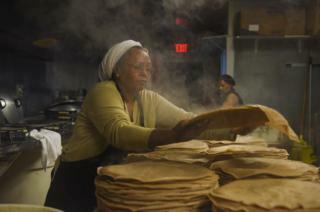 It's noticeable soon after you land in Washington - the city is full of Ethiopians. Their ubiquitous presence - behind the counter at Starbucks or the wheels of taxis - in the bastion of American government symbolises the two pillars of this alliance. The Ethiopian diaspora across America - the second largest community after Nigerians - has played an enormous role in influencing ongoing political reforms that have rocked Ethiopia since the beginning of 2018. Expatriate Ethiopians run numerous TV stations and online media which are beamed into Ethiopian homes or to smartphones more than 11,000 kilometres away in the motherland - often, in the past, with a message critical of the government. At the same time, US foreign policy significantly influenced last year's seismic events and is helping the Ethiopian government prepare the country for crucial national elections in 2020. During that visit, US Ambassador to Ethiopia Michael Raynor announced the US will be "embedding senior US government officials at key Ethiopian economic ministries and operations for a sustained period of time". Image caption United States Ambassador to Ethiopia Michael Raynor meeting Ethiopian Orthodox Church clergy. "No other African country has this sort of relationship with the US," says Tewodrose Tirfe, chair of the Amhara Association of America, a US-based advocacy group for the Amhara, Ethiopia's second-largest ethnic group. "Because Ethiopia was not colonised, it was able to have a formal direct relationship with the US that goes back to 1903 when the US representative handed his papers to Emperor Menelik." US influence in Ethiopia includes a sizeable financial component. Not including funding for security - the size of which isn't known - Ethiopia has received about $4bn (£3bn) from the US government over the last five years towards humanitarian issues and development. Meanwhile, remittances from Ethiopia's global diaspora was estimated in 2017 at $4.6bn, according to a report commissioned by the European Union. The largest portion originates from the US because of the number of people and the fact they are more wealthy than diaspora elsewhere, says Mr Tewodrose. Flowing through informal channels, much of that money moves between relatives but some goes towards supporting political opposition in Ethiopia - including armed resistance - all in the name of freedom. "Living in the US has a tremendous influence on how I perceive democracy and freedom of speech," says Gennet Negussie with the Ethiopian Advocacy Network, a grassroots collection of organisations promoting democracy, human rights and justice in Ethiopia, who has lived in the US since 1988. "My experience in the US has opened my eyes and created a desire to get involved in changing the authoritarian government in Ethiopia and helping with the democratisation of Ethiopia so people have a say in the political system." "Ethiopians came to the US for the same reasons as others, because it symbolises the ideals of freedom, respect for human rights, better opportunities for their children and that notion that if you work hard enough, there's no limit to what you can accomplish," says Mr Tewodrose. "And the stories of those who are successful, becoming engineers, professors, doctors, go back to Ethiopia and encourage others to try for the same experiences." "The Ethiopian diaspora established a good reputation for being hardworking and enterprising, excelling in performance, valuing education, providing community service and establishing churches," says Bonnie Holcomb, an anthropologist affiliated at George Washington University who has researched the Ethiopian diaspora for decades. "They integrated well, were not isolated, and showed they were not going to be a drain on the US coffers." Last year's reforms mean some of them who previously couldn't return to Ethiopia are now doing so, including exiled leaders of previously banned political parties. During protests between 2015 and 2018, Ivy League-educated Jawar Mohammed played a pivotal role in orchestrating Ethiopia's National Youth Movement for Freedom and Democracy - popularly known as the Qeerroo - young Oromo activists at the heart of protests and strikes that brought down Ethiopia's previous prime minister. Throughout these protests the US-based diaspora also lobbied the US government - while reaching out to human rights organisations and international media - to put additional pressure on the Ethiopian government. Finally, in 2018, a week after the 2 April swearing-in of Abiy Ahmed as Ethiopia's new prime minister, the US House of Representatives unanimously adopted a resolution that was unusually outspoken for US public policy in its criticism of Ethiopia's government. Image caption Though Abiy Ahmed (pictured on television) has his critics, he is enormously popular in Ethiopia and internationally for his rapid-fire reforms since coming to power in April 2018. The resolution - known as HR-128 - condemned excessive use of force by Ethiopian security forces; the detention of journalists, students, activists and political leaders; and the regime's abuse of anti-terrorism laws to stifle political and civil dissent and journalistic freedoms. "If you look at the reforms that followed in Ethiopia, they basically matched one for one the points in the resolution," says Mr Tewodrose, whose organisation collaborated closely with US lawmakers supporting the resolution. "We the diaspora know that by being here, in the world's most powerful country, we can try leverage that to influence things in Ethiopia, because the policy the US takes will likely be followed by other countries." The US was a strong ally of Emperor Haile Selassie - Ethiopian soldiers fought with the allies during World War Two and alongside Americans during the Korean War - but after he was overthrown by a military coup in 1974, Ethiopia pivoted to Russia for arms and financial and ideological sustenance. "The US has understood for many years that Ethiopia is a country of enormous consequence," says Mr Raynor, the US ambassador to Ethiopia. "A country with a large territory and a large population; a country with enormous potential and a rapidly growing economy; and a country that has played an outsized role in keeping the peace in Africa - and beyond - for many years,"
Image caption Intercultural event organized by US embassy in Addis Ababa, featuring Native American dancing and traditional Ethiopian dancing. "US diplomats have won the respect of Ethiopian authorities by not speaking out publicly while making constructive criticisms in private." This has led, some argue, to worsening ethnic tensions, especially negative perceptions of the Tigrayan minority group due to its association with the Tigray People's Liberation Front party that formerly dominated the government. Ethnic tensions are one of the biggest of many challenges facing Ethiopia's reforming government, Mr Tewodrose says. But he remains, like those at the US embassy in Addis Ababa, buoyant about the country's emerging prospects. "Ethiopia is in the midst of a moment unlike anything I've seen in my career - the opportunity to reinvent a country of great size and consequence into a true democracy," Mr Raynor says. "We feel strongly that the US has both an opportunity and an obligation to do everything we can to support the success of this moment. "Ultimately, it'll be up to the Ethiopian people to see it through," Mr Raynor adds, "but we will be absolutely be by their side, every step of the way."